Rotherham United travel to Preston on Saturday when Lancashire’s Jeremy Simpson is in charge. Jeremy was last in charge of a Millers game in August when Hull City were the visitors to the New York Stadium. Richard Wood put the hosts in front just after the quarter of an hour mark with Jackson Irvine equalising for City twelve minutes later. Fraizer Campbell put Hull in front just before half-time with Irvine scoring again two minutes into the second half. Jamie Proctor came off the bench to make it three-two and make it an interesting last fifteen minutes but the Millers couldn’t get anything from the game. Wood was booked for the hosts and Marcus Henriksen for Hull. 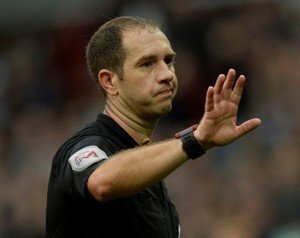 Jeremy has been in the middle for fifteen games so far this season showing a whopping sixty-seven yellow cards and four red cards. Running the line on Saturday are Shaun Hudson and Matthew McGrath while Ben Toner also from Lancashire is the Fourth Official.